On awakening, the crew of Apollo 11 receive some updates to their Flight Plan, and perform some spacecraft maintenance activities. They make their first Midcourse Correction by firing the Service Module engine, photograph the Earth, and listen to some music over lunch. This is Apollo Control; 15 hours, 28 minutes Ground Elapsed Time. Apollo 11 crew still asleep according to Flight Surgeon Ken Beers here in Mission Control. The flight crew is still sleeping soundly at this time according to the biomedical telemetry being beamed down to the displays on his console. Here in the Mission Control Operations Room [means Mission Operations Control Room], or MOCR as it is called, the Black Team of flight controllers is settling in for the night headed up by Flight Director Glynn Lunney. Some 7 hours remaining in the crew's sleep period. Distance and velocity now showing 72,009 nautical miles [133,361 km] out from Earth, velocity now 6,750 feet per second [2,057 m/s]. And at 15 hours, 28 minutes Ground Elapsed Time; this is Apollo Control. This is Apollo Control; 16 hours, 38 minutes Ground Elapsed Time. Apollo 11 presently being tracked by the Honeysuckle Creek, Australia tracking station. Geographically, the spacecraft is practically directly over or out from the Philippine Islands. Now showing some 5 hours and 51 minutes remaining in the crew rest period. Crew still asleep at this time. Continuing to decelerate as the spacecraft gets out toward the changeover point between the Earth's sphere of influence and the Moon's sphere of influence. Velocity now showing 6,493 feet per second [1,979 m/s]. Apollo 11 now out 76,453 nautical miles [141,591 km] from the Earth. And at 16 hours, 39 minutes Ground Elapsed Time; this is Apollo Control. This is Apollo Control; 17 hours, 33 minutes Ground Elapsed Time. 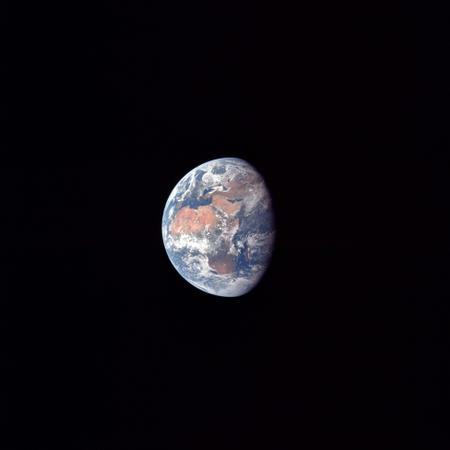 Apollo 11 now some 79,700 nautical miles [147,604 km] out from Earth at a velocity of 6,320 feet per second [1,926 m/s]. Telemetry display for the crew biomedical readings now shows all three men in a fairly deep sleep. The mean heart rates in the 40s for all three men. Command Module cabin pressure holding at 4.7 pounds per square inch [32.4 kPa]. Cabin temperature is 63 degrees [Fahrenheit, 17°C]. No measurements on the Lunar Module in terms of cabin pressure in as much as the Lunar Module has not been activated and will not be until shortly before entering lunar orbit. The first manning, the Lunar Module is checked out, systems are checked out and closed back up again. Spacecraft analysis reports coming out of the back room here in Mission Control Center read like some of the ones in Apollo 10 toward the end of the mission when they were down to one page. And most of the entries are all systems performance normal, systems operation normal, no change from last report, et cetera, et cetera. In the spacecraft fuel cell, the performance is normal and the load sharing is shown within 3.2 amps. Cryogenic hydrogen and oxygen quantities now show total oxygen at 558 pounds [253 kg], 279 pounds [127 kg] in each of the two tanks; 49 pounds [22 kg] of cryogenic hydrogen, 24.2 pounds [11.0 kg] in Tank 1, 24.8 [11.3 kg] in Tank 2. And the cryogenic system is performing normal. At 17 hours, 36 minutes Ground Elapsed Time; this is Apollo Control. This is Apollo Control; 18 hours, 38 minutes Ground Elapsed Time. 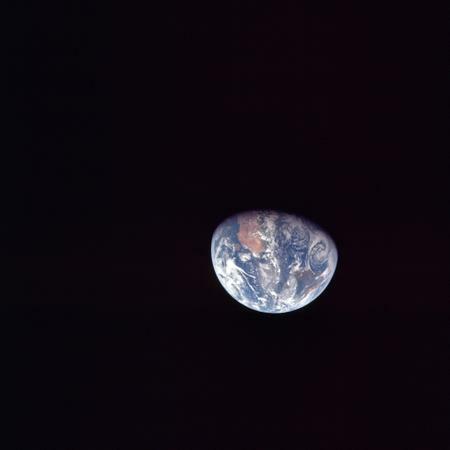 Apollo 11 now some 83,644 nautical miles [154,909 km] out from Earth, continuing to decelerate in velocity, now some 6,114 feet per second [1,864 m/s]. The reveille time for the crew of Apollo 11 in some 3 hours and 50 minutes. All systems still functioning normally aboard the spacecraft as the crew continues their nine-hour rest period. All measurements normal, as the flight controllers here watch the systems on telemetry and the displays here in the control center. At 18 hours, 39 minutes Ground Elapsed Time; this is Apollo Control. This is Apollo Control; 19 hours, 43 minutes Ground Elapsed Time. Crew now has some 2 hours, 46 minutes remaining in the scheduled sleep period. Distance outbound from Earth now 87,409 nautical miles [161,882 km]. Apollo 11's continuing to decelerate in velocity, now traveling at 5,930 feet per second [1,807 m/s]. All going well in the Apollo 11 mission. Crew sleeping apparently in deep sleep. Systems still performing quite well. And at 19 hours, 43 minutes Ground Elapsed Time; this is Apollo Control. This is Apollo Control; 20 hours, 38 minutes Ground Elapsed Time. One hour, 51 minutes remaining in the crew rest period at this time. Apollo 11 on a line projected outward from Earth as directly over the southern tip of the Indian sub-continent. Distance now 90,509 nautical miles [167,623 km]. Velocity continuing to decelerate, now 5,788 feet per second [1,764 m/s]. Crew is still asleep at this time. And at 20 hours, 39 minutes Ground Elapsed Time; this is Apollo Control. This is Apollo Control; 21 hours, 38 minutes Ground Elapsed Time. Apollo 11 now being tracked by the tracking station at Madrid. Some 51 minutes remaining in the scheduled sleep period for the crew of Apollo 11. When the sleep period ends depends on the business of the day, whether the flight controllers here and the spacecraft communicator wake the crew up or whether they wake up on their own accord and call in to begin the second day of translunar coast. Upon awakening the Flight Plan calls for change of the carbon dioxide removing filters in the spacecraft cabin, a report on the differential pressure between the Lunar Module and the Command Module, update from the ground on consumables remaining. They will remain in the Passive Thermal Control mode through the hour-long eat period that follows the wake-up. 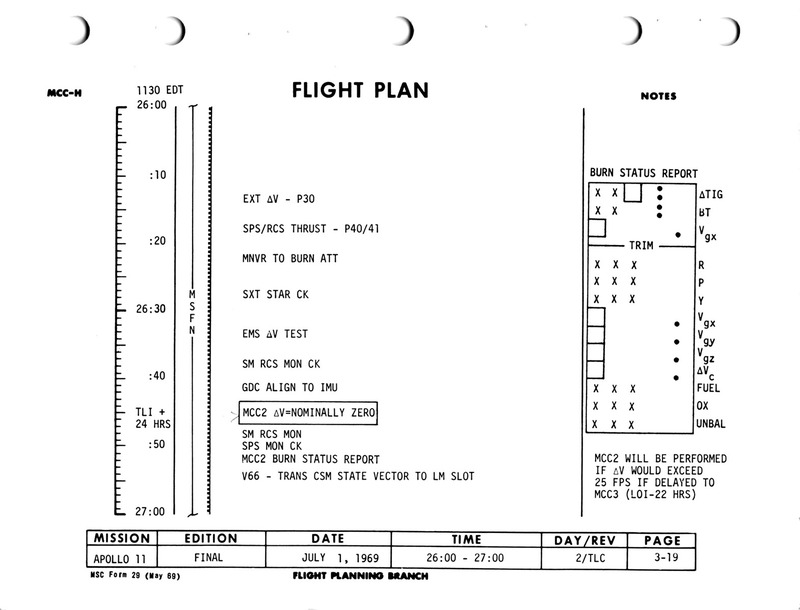 After their breakfast meal, the Flight Plan calls for some navigation exercises using the sextant and the Program 23 computations of the onboard computer. These are star and Earth-horizon sightings. Presently Apollo 11 is some 93,885 nautical miles [173,875 km] out from Earth. Velocity now 5,638 feet per second [1,718 m/s]. At 21 hours, 40 minutes Ground Elapsed Time; this is Apollo Control. At some point between 10 and 30 hours, Buzz begins to transmit video to Earth. This clip is kindly donated by Mark Gray. This is Apollo Control at 22 hours, 49 minutes Ground Elapsed Time. Crew has been awake for some time according to the surgeon. Spacecraft communicator here in Mission Control with the Green Team, Bruce McCandless, is standing by to make a call to the crew. He's in the process of taking over from Ron Evans. Flight Director Cliff Charlesworth has asked that he make a call to the crew. We're standing by for this call momentarily. 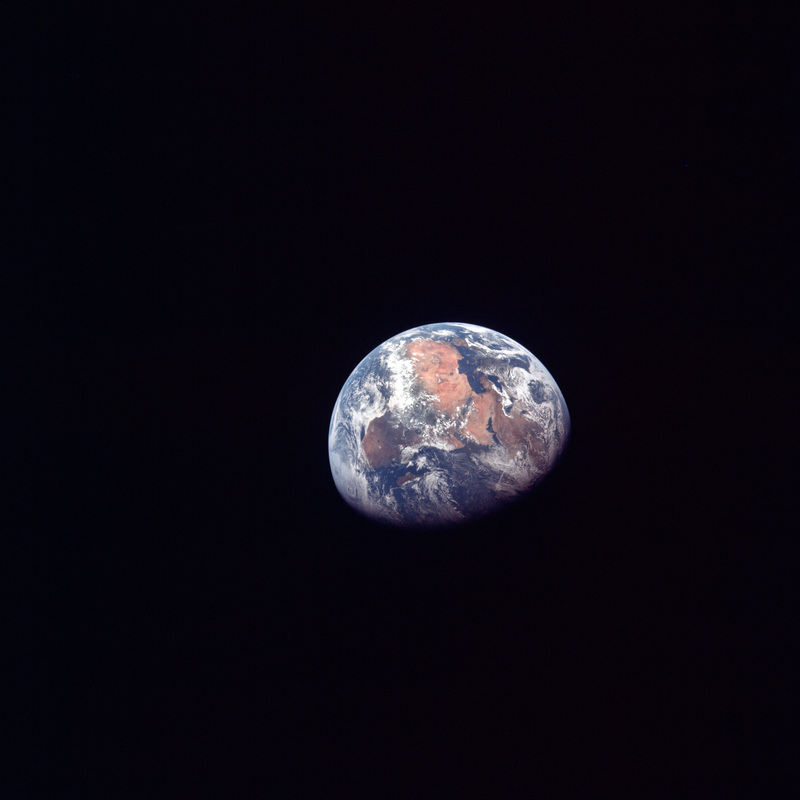 022:50:15 McCandless: Apollo 11, Apollo 11, this is Houston. Over. 022:50:21 Aldrin: Good morning, Houston. Apollo 11. 022:50:24 McCandless: Roger, Apollo 11. Good morning. 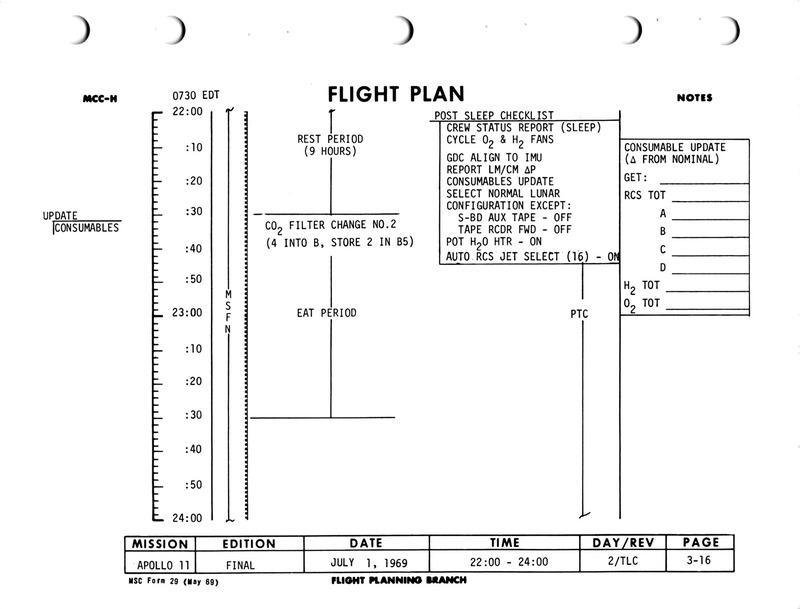 022:50:32 McCandless: When you're ready to copy, 11, I've got a couple of small Flight Plan updates and your consumables update, and the morning news, I guess. Over. 022:51:58 McCandless: Go ahead, 11. 022:52:02 Aldrin: [Faint] Roger. Standing by for your updates. Over. 022:52:10 McCandless: Okay, 11. This is Houston. 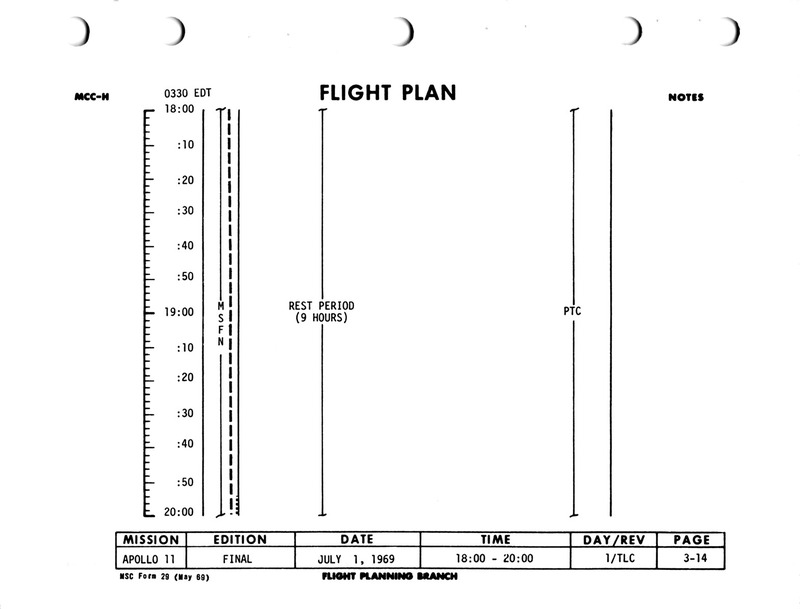 At time approximately 22:30 in the Flight Plan, in your post-sleep checklist, and in all other post-sleep checklists, we'd like you to delete the statement that says Auto RCS Jet Select, 16, to On, and what we're doing here is picking this up in the procedure for exiting PTC that's in your CSM checklist. And in the CSM checklist on page Foxtrot 9-8: if you want to turn to that, we'd like to change the order of the steps in that. Over. 022:53:37 Aldrin: [Faint]Okay. Page F9-8. Go ahead. 022:53:40 McCandless: Okay. Right now it reads, "To exit G&N PTC". Then you've got a pen-and-ink change that says, "Auto RCS Select, 12, Main A and B". And you come down to the printed Step 1. We'd like to take and move the "Auto RCS Select, 12, Main A and B" down to be the second step, so the procedure would read, Step 1, "Manual Attitude 3, Accel Command"; Step 2 "Auto RCS Select, 12, Main A B." Step 3 would be, "Verify DAP Load", and so on. Over. 022:55:06 Aldrin: Okay. 24:10. Go ahead. In the middle of this pause, there seems to be some very low-level modulation that might be Buzz trying to talk on the air/ground. 022:56:48 McCandless: Apollo 11, this is Houston. Did you copy the attitudes and the waste-water dump? Over. 022:57:14 McCandless: 11, this is Houston. We're not reading you at the present time. You're way down in the noise level. Stand by, please. 022:57:23 Aldrin: Okay. Standing by. 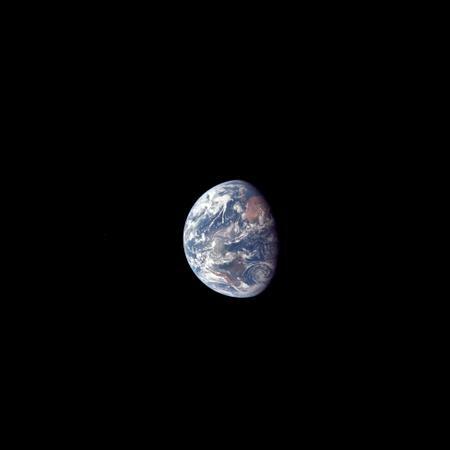 022:59:04 McCandless: Apollo 11, this is Houston. How do you read? Over. 022:59:10 Aldrin: Roger, Houston. Apollo 11. Loud and clear. How me? 022:59:12 McCandless: Okay. Beautiful. Did you copy the attitudes for the P52 and the waste-water dump? Over. 022:59:20 Aldrin: Rog. Okay. We note the battery charge as soon as we get around to it, and the attitude for the P52 optics Cal: roll, 330.5; pitch, 086.3; and yaw, all zeros. The attitude for the P23 as in the Flight Plan is okay, and I copy your battery charge. Crew status report as follows. Sleep: CDR, 7; CMP, 7; LMP, 5.5. And we've completed the post-sleep checklist. Standing by for a consumable update. Over. 023:01:08 Aldrin: I copied those consumables, and I'll read you back our RCS quantities. We got 86 percent in Alpha, 87 in Bravo, 88 in Charlie, and 90 in Delta. Over. 023:01:46 McCandless: And did you copy the waste-water request? 023:01:50 Aldrin: Roger. Waste-water at - and we got the time on that, and it will be down to 25 percent. 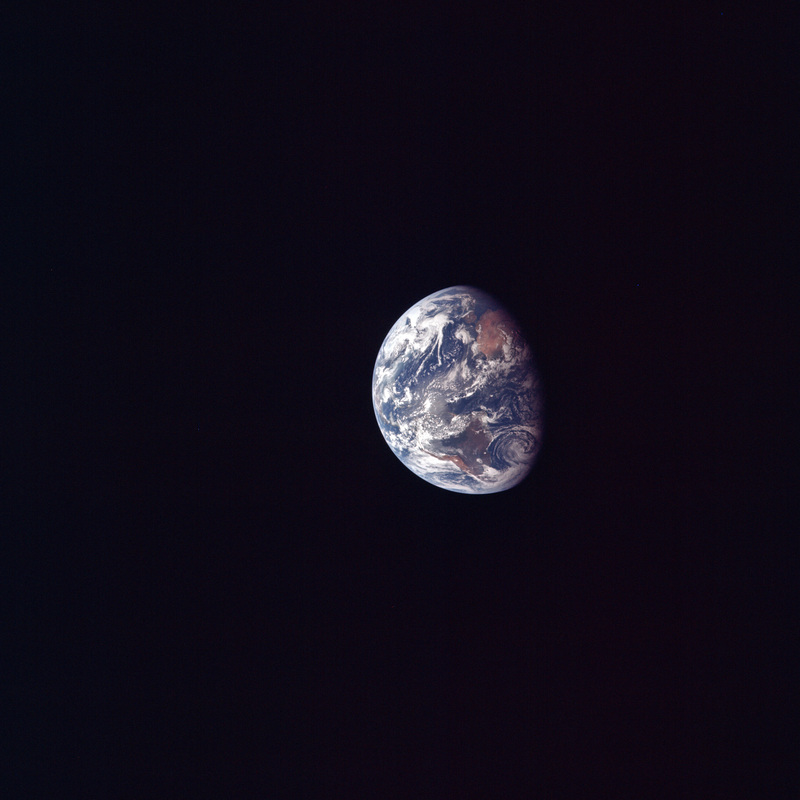 023:06:51 McCandless: Apollo 11, this is Houston. Over. 023:06:55 Aldrin: Roger. We've started charging Battery A, and the voltage started off a lot higher than I expected. It was just a little bit shy of 40. It looks like it's dropping down some now, the battery charge voltage. Seemed to me yesterday when we were doing this on Battery C, it started out initially on a much lower battery charge voltage. Over. 023:07:20 McCandless: Roger. Stand by a second, and I'll get some reading on that. 023:07:29 Aldrin: On charging Battery A: now, it's at about 39.3 and, oh, about 1.5 amps. Looks like it's gradually increasing in the amps charge [garble]. 023:07:42 McCandless: Roger. On our TM, we're showing you at 39.11, and your current's about what you report. TM is short for telemetry. Aldrin and Mission Control are essentially comparing readings of the same parameter. 023:07:58 McCandless: I think we're losing you in the noise again, 11. Stand by. 023:10:33 McCandless: Apollo 11, this is Houston. Over. 023:10:39 Aldrin: Houston, Apollo 11. Go ahead. 023:10:41 McCandless: Roger, 11. On your battery charging question, we feel that it's probably a difference between individual batteries; and it does seem to have gone away as sort of a start-up transient here. Other factors that might conceivably have an influence on it would be battery temperature, things of this sort. EECOM seems to feel that it's operating within the normal design limits. Over. 023:11:12 Aldrin: All right. Very good. Thank you. 023:14:09 McCandless: 11, this is Houston. If you're interested in the morning news, I've got a summary here from PAO. Over. 023:14:20 Armstrong: Okay. We're all listening. 023:18:07 Armstrong: Roger. Thank you, Bruce. Another thing on that number 2 item, we all [garble] before we left, and we hope we get a chance to see him another time. Over. 023:18:27 McCandless: Roger. And I understand he was down there and really enjoyed watching the launch. We all think it was pretty magnificent, and you all are doing a great job up there. Based on measurements of Earth's image on the scanned film of Hasselblad magazine N, it is likely that four photographs were taken around this time; three in quick succession and the fourth a few minutes later. By measuring the rotation of the planet between the last two images, it appears that 5355 was taken about 13 minutes after 5354. Animation of AS11-36-5354 and 5355 to show the rotation of the planet between the two photos. One of these near-identical images, perhaps 5354 as it seems to be marginally sharper, has been widely reproduced as one of the most famous Earth photographs taken during the Apollo program, and was extensively used by the environmental movement. It appeared in many prominent publications, including on the cover of the best-selling Penguin paperback, Only One Earth: The Care and Maintenance of a Small Planet, by Barbara Ward and René Dubos, published in 1972 for the UN Stockholm conference on the Human Environment. This is Apollo Control at 23 hours, 22 minutes. Apollo 11's distance from Earth is 99,308 nautical miles [183,918 km]. Velocity, 5,411 feet per second [1,649 m/s]. The spacecraft weight, 96,361 pounds [43,709 kg]. A flight dynamics officer reports that, in terms of distance, Apollo 11 will reach the half-way mark at 25 hours, 0 minutes, 53 seconds. At that time the spacecraft will be 104,350 [nautical] miles [193,256 km] from both the Earth and the Moon. This is Apollo Control at 23 hours, 48 minutes. CapCom Bruce McCandless is getting ready to put in a call to the crew momentarily. Apollo 11's distance now is 100,685 nautical miles [186,467 km]. Velocity, 5,356 feet per second [1,633 m/s]. 023:57:03 McCandless: Apollo 11, this is Houston. Over. 023:57:08 Aldrin: Roger. Go ahead, Houston. 023:57:16 McCandless: Roger. Mike, we've got some comments on the performance of P23 for today if you've got a minute to talk. 023:57:20 Aldrin: He's all ears. 023:57:22 Collins: Yeah. Go ahead. 023:59:41 Collins: Roger. Stand by one. We're going to stop PTC, and then we'll talk about this P23. Apollo 11 is now going out of the Passive Thermal Control mode in which it was slowly rotating to maintain thermal balance. Getting set up for the P23 activities. That's the midcourse navigation. CapCom Bruce McCandless is passing up some changes in the procedures for this navigational operation. 024:02:10 Collins: Houston, Apollo 11. 024:02:11 McCandless: Go ahead, 11. 024:02:13 Collins: Okay. We're stopping PTC now and maneuvering to our P52 and optics cal attitude. In regard to the P23, what I was trying to tell you yesterday was about that. The M-line is not anywhere parallel to the horizon at the roll, pitch, and yaw which you gave me to go to for the substellar point, and I was trying to maneuver off to get it parallel to the horizon when you all said that was not necessary. 024:03:49 McCandless: Roger, 11. We don't have that capability. We do require that the M-line be parallel to the horizon in order to get a good mark. We feel that possibly the - the state vector information that you were using for your maneuver basis yesterday may have needed to be updated a little. And if you'll stand by a second, we'll give you an evaluation of what we feel you'll get today by the Auto maneuver. When Mike attempted to carry out a navigation exercise before their sleep period, it didn't go too well. The idea was that he would manoeuvre the spacecraft in order to aim the sextant's fixed line of sight at Earth's horizon. More specifically, Mission Control had given him accurate attitude angles that ought to have placed this at the substellar point, a point that is the nearest or furthest point on the planet's limb from the star with which the angle is being measured. Diagram to show the substellar points for near and far horizons. After the exercise, Mike complained that Mission Control's values were not taking him to the substellar point, implying that an inaccuracy had crept into the system somewhere. 024:10:56 Aldrin: Houston, Apollo 11. Over. 024:11:01 McCandless: Go ahead, 11. 024:11:03 Aldrin: Roger. I'm getting ready to do an O2 fuel cell purge. Do you have any particulars on this? And I assume you want these one at a time, or can I triple up? Over. 024:11:13 McCandless: We'd like them one at a time, and stand by. I don't think we have any sequence. You can do them in any order you want. 024:11:26 McCandless: And we're watching you on TM down here. Mike is carrying out a realignment of the spacecraft's guidance platform using Program 52 in the computer. The two stars that he will use are star 36 (Vega, Alpha Lyrae) and 37 (Nunki, Sigma Sagittarii). His accuracy in this instance is excellent as shown by a display of 'all balls' for Noun 05, the star angle difference. This is a comparison of the actual and measured angles between these two stars. From these sightings, he determines how far the platform has drifted since the last P52 15 hours ago. The values he will come up with, in Noun 93, are -0.493° in X, -0.191° in Y and -0.024° in Z. 024:15:03 Collins: Houston, Apollo 11. You want to look at these Noun 93s before I proceed on? 024:15:11 McCandless: Yes, please. Stand by a second. 024:16:12 McCandless: 11, this is Houston. On our TM, here, we're only seeing values in two registers. Can you read us out the contents of Register 3, please? 024:16:22 Collins: Register 3: minus three balls 24. 024:16:25 McCandless: Roger. Minus three balls 24. And you can go ahead and Proceed. 024:16:58 McCandless: 11, Houston. After you've completed P52, we'd like to uplink you a new state vector so we can start out clean on this P23. Over. 024:17:34 Aldrin: Houston, Apollo 11. It's triggered the Master Alarm three times, now. [Master alarm goes off in the background] There goes number four. It goes up to about 1.4, then oscillates back down to about 1.1. Over. 024:18:01 Collins: And we're in P00, now, for a state vector. 024:18:06 McCandless: Roger. Give us Accept, please. 024:18:41 McCandless: 11, Houston. On your O2 flow, Fuel Cell 3: apparently it was flowing a little higher than the other two during purge, but the flow rate's acceptable. Over. 024:18:56 Aldrin: Roger, understand. It seems to be flowing a little bit more, and actually putting out more current than the other two, also. Over. 024:19:51 McCandless: 11, this is Houston. We've completed the uplink; the computer is yours. You can go back to Block. During periods of no communication, when there is good reception from the spacecraft, it is not unusual for a little of the crew's conversation to break through onto the radio link, though very distorted. One instance of this prompts McCandless to think that the crew were calling. 024:20:47 Aldrin: Houston, 11. I don't believe we were calling you right then. This is Apollo Control at 24 hours, 22 minutes into the mission. Apollo 11's distance from the Earth is 102,436 nautical miles [189,712 km]; velocity, 5,288 feet per second [1,612 m/s]. 024:23:53 Collins: Houston, Apollo 11. 024:23:56 McCandless: Apollo 11, this is Houston. Go ahead. 024:24:00 Collins: Rog. I'm in a good attitude here to do - I have in the sextant this last P52 star [off-mike to crewmate] What number's [garble]? [to CapCom] star 37. Is that all right for the optics calibration to save some gas, or do you want to go over to star 40? 024:24:23 McCandless: Star 37 will be fine for the optics calibration. And we haven't noticed a Verb 66, yet, after our state vector uplink. Over. 024:24:37 McCandless: When you move on into P23, we recommend that you use the CMC-computed angles for your Auto maneuver and see how that works out. If it doesn't bring you up with the M-line parallel to the horizon to the substellar point, we'll see if we can get you some ground-computed angles. I guess the big thing here is to make sure that the M-line is parallel to substellar point so we can get a good angular measurement. Over. 024:25:06 Collins: Yeah. I believe. Star 37 is Nunki. N, U, N, K, I. Apollo 11 is now in Program 52 which is re-alignment of the platform prior to beginning the cislunar navigation operation. To take the PAO's explanation further, star 40 is Altair (Alpha Aquilae). With a newly aligned platform and a fresh state vector, the spacecraft's computer should be well-placed to calculate an accurate attitude to aim the sextant's fixed line of sight at the substellar point for the coming P23 cislunar navigation exercise. 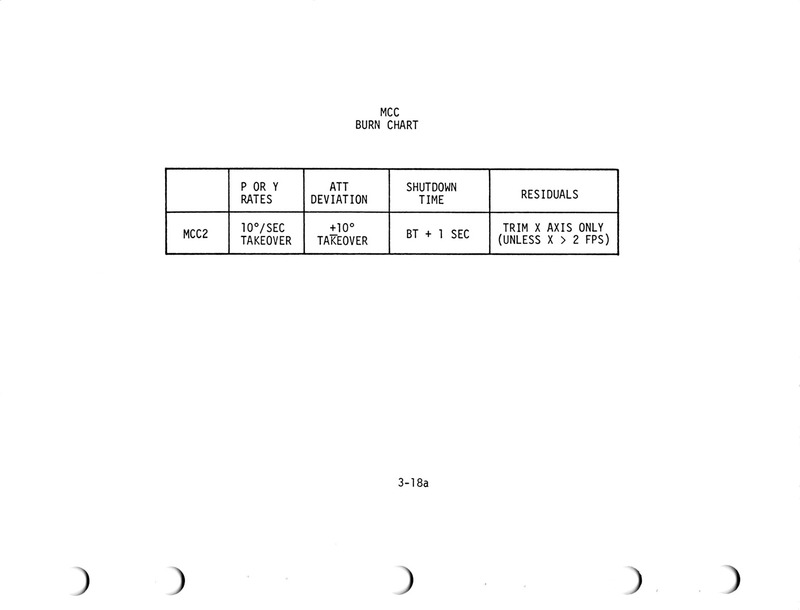 McCandless has asked for a Verb 66 which is an instruction to make a copy of the state vector that is in the CSM slots of the computer and put it in the LM slots. That will then become the starting point for Mike's P23 determination of the state vector. 024:29:25 Collins: Houston, Apollo 11. Marking on this star, I get a Noun 87 twice in a row of five balls, so that's sufficient for a Cal. 024:29:33 McCandless: That's certainly very sufficient. Noun 87 presents the optics calibration data. Having 'zeroed the optics' which brings the shaft angle to its centre, zero-degrees parking position, the procedure requires that a star be viewed through the sextant's fixed line of sight (known as LLOS or Landmark Line Of Sight in the documentation). The trunnion angle is then reduced to bring the image of the same star through the Star Line Of Sight (SLOS) to be superimposed on the LLOS image. In this condition, both the shaft angle and the trunnion angle ought to be zero; in other words, reading five balls on the first two register displays of the DSKY. 024:29:40 Collins: Okay. Now I want to go to P00, and I'm going to take your three angles and do a Verb 49 maneuver to your substellar point. Okay? 024:29:53 McCandless: Okay. We recommend that for the first star, if we gave you a new state vector, we'd like to try the CMC-computed angles for the Auto maneuver. 024:30:18 McCandless: And have you hit Proceed on this display to enter the zero? 024:30:54 McCandless: 11, Houston. Over the past 2 hours we have seen a slight continuing increase in partial pressure of CO2. Have you in fact changed the CO2 canister yet this morning? We don't need to do it right now; we'd just like to confirm that our instrumentation is in good shape. Over. 024:31:13 Aldrin: No. We haven't changed any canisters this morning. 024:31:19 McCandless: Okay. Then you can plan on accomplishing that after P23 is over and you've got the LEB clear. 024:31:57 Collins: Houston, Apollo 11. We're in process of maneuvering to P23's desired attitude. It likes roll 8.37, pitch 61.33, and yaw 339.87. Over. 024:32:13 McCandless: Roger. We copy. And that's for star 01? 024:32:19 Collins: Star 01, Earth near horizon. Code 110. 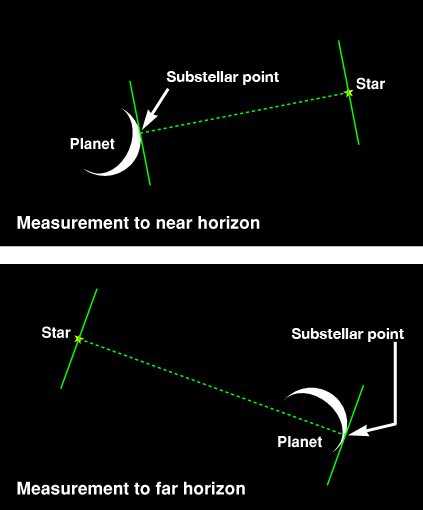 When the CMP measures the angle between a star and a planet's horizon, he has to tell the computer whether he's measuring to the horizon nearest the star or furthest from the star. This is required because only one horizon will be visible depending on which side of the planet is illuminated by the Sun. Star 01 is Alpheratz (Alpha Andromedae). 024:41:07 Collins: Houston, Apollo 11. On this star, the Auto maneuver works just fine. I'm right at the substellar point. Everything looks beautiful except there is no star in sight. It is just not visible. 024:41:20 McCandless: Roger. This is for star 01? 024:41:29 McCandless: You're not getting any reflections or anything like that that would obscure your vision, are you? 024:41:40 Collins: Well, of course, the Earth is pretty bright, and the black sky, instead of being black, has sort of a rosy glow to it, and the star, unless it's a very bright one, is probably lost somewhere in that glow, but it is just not visible. I maneuvered the reticle considerably above the horizon to make sure that the star is not lost in the brightness below the horizon. However, even when I get the reticle considerably above the horizon so the star should be seen against the black background, it still is not visible. 024:42:47 McCandless: 11, this is Houston. Can you read us the shaft and trunnion angle off the counters? 024:42:55 Collins: Yeah, be glad to. Shaft, 331.2 and trunnion, 35.85. 024:43:04 McCandless: Roger. Thank you. The sextant's arrangement has a fixed line of sight which can be rotated 360° around a shaft, giving the shaft angle. When it does so, it takes with it a tilting prism arrangement that yields a moveable line of sight superimposed upon it. This latter axis derives it name from the supporting cylinders that emanate from the sides of an old-fashioned cannon to allow it to pivot in altitude. Those cylinders were known as trunnions and engineers took this term for the sextant's tilting arrangement and therefore we get a trunnion angle for the star line of sight which can be up to 50° away from the fixed line of sight. The sextant's optical magnification is 28 times, which makes it an excellent instrument with which to study the now distant Earth. 024:45:35 Collins: It's really a fantastic sight through that sextant. A minute ago, during that Auto maneuver, the reticle swept across the Mediterranean. You could see all of North Africa, absolutely clear; all of Portugal, Spain, southern France; all of Italy, absolutely clear. Just a beautiful sight. 024:45:54 McCandless: Roger. We all envy you the view up there. 024:45:59 Collins: But still no star. 024:47:19 McCandless: 11, this is Houston. Over. 024:47:23 Collins: Go ahead, Bruce. 024:47:25 McCandless: Roger. On our ground computers we confirm the shaft and trunnion angle that you have as being pointed at the star. However, it looks as though that shaft and trunnion angle is also pointing into the structure of the LM, so that while you will be getting the Earth's horizon, the star LOS is obscured by the LM. We recommend an Auto maneuver to the attitudes in the - pen-and-inked into the Flight Plan. Roll 177.2, pitch 298.2 and yaw 330.0. Over. 024:48:04 Collins: Okay. Fine. Let's try that. 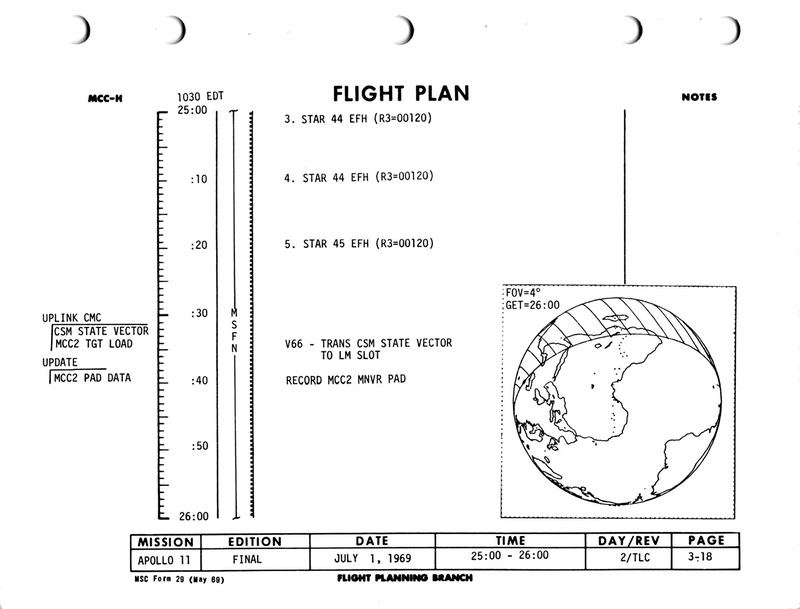 The attitude angles that the onboard computer came up with to aim the fixed line of sight at the substellar point on Earth's horizon, also happened to hide Alpheratz behind the LM, which perhaps says a litle about the lack of sophistication of the CMC's software. It is worth noting that with the objectives of the optics being mounted on the upper part of the CM's conical surface, the LM actually obscures a substantial amount of their field of view. 025:06:52 McCandless: 11, this is Houston. While you're maneuvering there, could we get a LM/CM Delta-P reading from you? Over. 025:07:01 Collins: Rog. Just a tad under 1, Bruce, 0.95 [psi, 6.5 kPa]. This is Apollo Control. That reading was the difference in pressure between the Lunar Module cabin and the Command Module cabin. Strictly speaking, it is the difference in pressure between the tunnel and the CM cabin. However, since a valve in the LM's overhead hatch has been deliberately left open, the reading will reflect the pressure in the LM cabin also. Note that the pressure gauge that Mike is reading is only connected across either side of the forward hatch when the Tunnel Vent Valve is in its "LM/CM Delta-P" position. If the valve is in any other position, then the gauge reading is meaningless. In Mission Control, the backup commander of Apollo 11, Jim Lovell, has temporarily taken the CapCom position. 025:11:14 Lovell: Apollo 11, Houston. This is Jim Lovell calling Apollo 11. 025:11:36 Armstrong: This is the Commander [garble]. 025:11:39 Lovell: I was a little worried. This is the backup Commander still standing by. You haven't given me the word yet. Are you Go? 025:11:48 Armstrong: You've lost your chance to take this one, Jim. 025:11:53 Lovell: Okay. I concede. 025:13:36 Collins: Houston, Apollo 11. 025:13:41 McCandless: Go ahead, 11. 025:13:43 Collins: Okay. Our maneuver is complete, and at this attitude the M-line is exactly 90 degrees out of phase. It is exactly pointed along the vector toward the center of the Earth instead of being parallel to the horizon. 025:14:16 Collins: I'm going to hold right here for your next suggestion. 025:18:19 Collins: Okay, Houston. It appears to be okay now. We've changed our attitude slightly, and I have a star and I'm maneuvering to get the M-line parallel. 025:18:34 McCandless: This is Houston. Roger. We copy. 025:20:29 Armstrong: Houston, Apollo 11. You - stand by one. Distance is now 103,263 nautical miles [191,243 km]. Velocity 5,256 feet per second [1,602 m/s]. This is Apollo Control. Belay that last announcement. Those figures are not based on the proper Ground Elapsed Time. This display is static. We don't have the present numbers. 025:36:08 Collins: Houston, Apollo 11. Are you copying these Noun 49s. I've been going through them fairly swiftly? 025:36:14 McCandless: Yes. We certainly are. I see a - what a plus 0.1 and a plus 0.2 on nautical miles and feet per second. Over. Verb 59 means 'Please calibrate'. 025:44:01 Collins: That's right. I - I haven't entered - I gave the - I gave it back to the computer for a second. I put the mode switch from Manual back to CMC while I fooled with the DSKY, and the computer drove the star off out of sight. So the delay here has been in going back to Manual and finding the star again, which I've finally done. And in just a second here, I'll go to Enter and get a 51 and mark on it. As I say, for some reason the computer drove the star off out of sight. 025:44:47 McCandless: Okay. Roger. Out. 025:48:14 McCandless: Apollo 11, this is Houston. Over. 025:48:24 McCandless: Roger. We show you with a little less than an hour to the Midcourse Correction number 2 burn. We recommend that you terminate the P23 activities here and press on with a waste-water dump, which we need from you, and getting ready for the burn. Over. When water is dumped from the spacecraft, it has a tiny propulsive effect that affects the spacecraft's trajectory. Mission Control want the dump to go ahead soon so that radio tracking after the burn will be inclusive of the dump's effects. 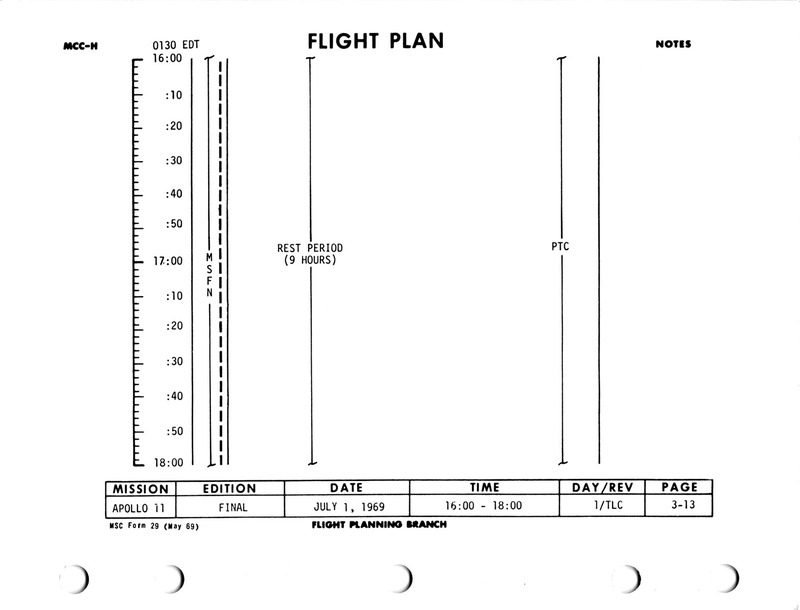 MCC number 2 in the Flight Plan will in fact be the first Midcourse Correction actually carried out, because MCC-1 was deemed unnecessary and was cancelled. 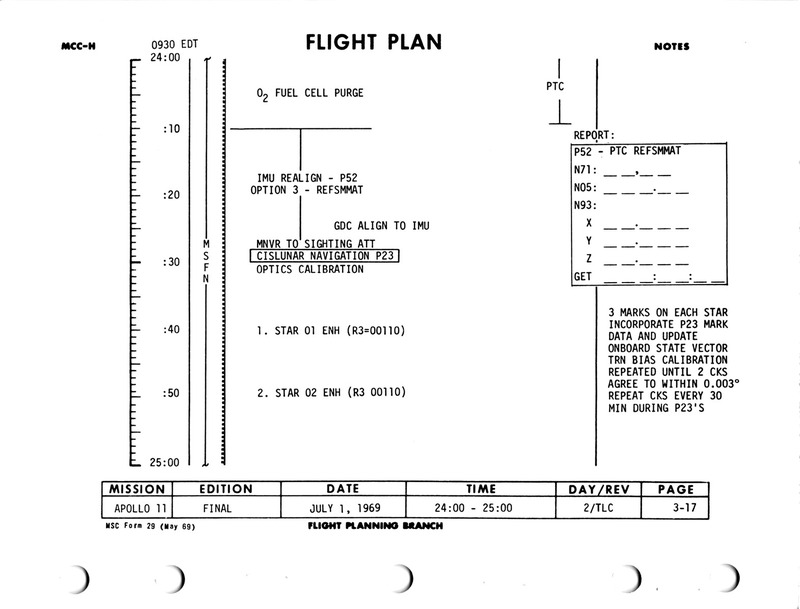 025:48:44 McCandless: And I have your Midcourse Correction number 2 PAD here when you're ready to copy. 025:49:15 Aldrin: [Faint.] Roger, Houston. Apollo 11, ready to copy MCC-2. 025:49:20 McCandless: Apollo 11, this is Houston. Midcourse Correction number 2. SPS/G&N; 63059; plus 0.97, minus 0.20; GET ignition 026:44:57.92; plus 0011.8, minus 0000.3, plus 0017.7; roll, 277, 355, 015; Noun 44, Block is N/A; Delta-VT 0021.3, 00:3, 0016.8; sextant star 30, 208.2, 37.0. The rest of the PAD is N/A. GDC align, Vega and Deneb; roll align 007, 144, 068. No ullage. LM weight: 33302. For your information, your heads will be pointed roughly towards the Earth on this burn. Read back. Over. 025:51:12 Aldrin: Roger. Midcourse Correction number 2. SPS/G&N: 63059; plus 0.97, minus 0.20; 026:44:57.92; plus 0011.8, minus 0000.3, plus 0017.7; 277 - Are you still copying, Houston? Over. 025:51:50 McCandless: Roger. Still copying. Go ahead. [Long pause.] Apollo 11, this is - Apollo 11, this is Houston. I copied your transmission about roll, 277. And go ahead from roll, 277. Over. 025:52:19 Aldrin: Roger. 355, 015; N/A; 0021.3, 00:3, 0016.8; 30, 208.2, 37.0. Vega and Deneb; 007, 144, 068. No ullage. LM weight, 33302. Heads towards the Earth. Over. An interpretation of the PAD follows. Purpose: This burn is to correct the spacecraft's trajectory at the second opportunity given in the Flight Plan. The first opportunity was not used. CSM Weight (Noun 47): 63,059 pounds (28,603 kg). Time of ignition, TIG (Noun 33): 26 hours, 44 minutes, 57.92 seconds Ground Elapsed Time. Change in velocity (Noun 81), fps (m/s): x, +11.8 (+3.6); y, -0.3 (-0.1); z, +17.7 (+5.4). These velocities are all with respect to the Earth and the local vertical and horizontal that the spacecraft makes with that body. Spacecraft attitude: Roll, 277°; Pitch, 355°; Yaw, 15°. This is with respect to the attitude of the guidance platform, itself aligned to the PTC REFSMMAT. HA (Noun 44): The apogee of the expected orbit. Not applicable. HP (Noun 44): Expected perigee of resulting orbit. Not applicable. Delta-VT (total velocity change): 21.3 fps (6.5 m/s). Burn duration or burn time: 3 seconds. Delta-VC: 16.8 fps. (5.1 m/s) This is the value to be entered into the EMS Delta-V display. A lower value, to take into account the extra thrust the engine imparts as it tails off, the EMS will stop the burn if the G&N system fails to do so. Sextant star: Star 30 (Menkent, Theta Centaurus) visible in sextant when shaft and trunnion angles are 208.2° and 37.0° respectively. The next five parameters, which all relate to re-entry, are all not applicable to this burn. GDC align angles: x, 7°; y, 144°; z, 68°. With the SPS propellant tanks nearly full, so there is no need for an ullage burn to settle their contents. The weight of the LM is 33,302 pounds (15,106 kg). 025:52:46 McCandless: 11, this is Houston. Readback correct. Out. 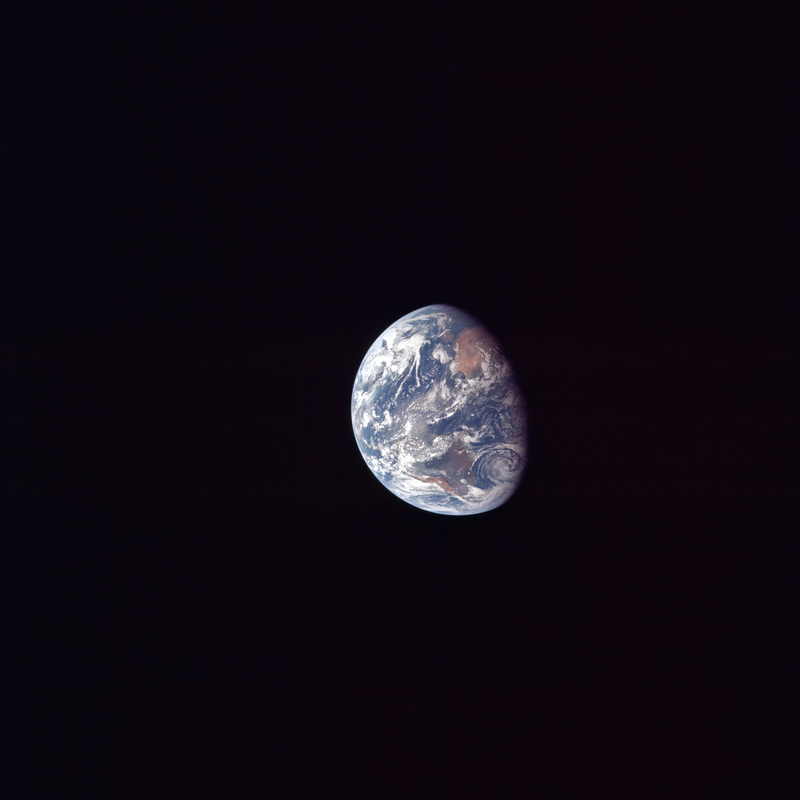 025:54:02 McCandless: Apollo 11, Houston. Over. 025:54:08 Aldrin: Go ahead, Houston. Apollo 11. 025:54:09 McCandless: Roger. We'd like you to terminate Battery A charge at GET 26 hours and re-initiate Battery A charge after Midcourse Correction 2. Over. 025:54:23 Aldrin: Apollo 11. Roger. This is Apollo Control at 25 hours, 58 minutes. Apollo 11's distance is now 107,224 nautical miles [198,579 km]. Velocity, 5,106 feet per second [1,556 m/s]. 025:59:37 McCandless: 11, this is Houston. Over. 025:59:43 McCandless: Roger. If you can give us Accept, we'll send you up a state vector and a target load for the maneuver. 025:59:52 Aldrin: Okay. Give us 1 minute to check the P23 damage. It is unclear what Buzz means by 'P23 damage'. A possibility is that Mike is looking to see how his copy of the state vector, the one in the LM slots, has changed with his sightings. 026:00:31 Aldrin: Houston, Apollo 11. The DSKY's yours. 026:00:35 McCandless: Houston. Roger. Out. This is Apollo Control at 26 hours. The ignition time for this midcourse correction will be 26 hours, 44 minutes, 57 seconds - about 44 minutes from now. It will be a Service Propulsion System maneuver. Duration of the burn will be 3 seconds. The Delta-V, 21.3 feet per second [6.5 m/s]. This midcourse maneuver should reduce the pericynthion of Apollo 11's trajectory from the present 175 nautical miles [324 km] to 60 nautical miles [111 km]. In other words, a mere 3-second burn of the SPS engine at this stage of the coast will change the height at which they pass above the Moon's far side by over 200 kilometres, an illustration of the sensitivity of celestial mechanics. 026:03:49 McCandless: 11, this is Houston. We've completed the uplink. The computer is yours. 026:07:17 Aldrin: Houston, Apollo 11. 026:07:21 McCandless: Apollo 11, this is Houston. Over. 026:07:24 Aldrin: Roger. I wonder if you have a star that might be a little closer to the direction we're burning than the one you gave us. 026:07:33 McCandless: Roger. We're going to re-work the attitude in the sextant star for you in order to improve the High Gain Antenna coverage, and we'll have that for you in a few seconds. 026:07:43 Aldrin: Fine. We're already maneuvering to that attitude. As they manoeuvre, the signal from the spacecraft weakens and becomes noisier. Come the time of the midcourse correction burn, it is vital that the spacecraft be in the correct attitude so that the force applied by the engine will be in the right direction. As a check of their attitude, the manoeuvre PAD included a star, number 30 (Menkent, Theta Centaurus) that ought to be in the sextant's field of view when the spacecraft is properly orientated and the instrument's shaft and trunnion angles are as prescribed. 026:08:02 Aldrin: Maybe you can make it just a change in roll. Apollo 11. Over. 026:08:45 McCandless: 11, this is Houston. Over. 026:09:36 Aldrin: [Garble] Apollo 11. Roll 096, 356, 018, star 01 [garble]. 026:10:05 Aldrin: Roger, Houston. Apollo 11. How do you read now? 026:10:10 McCandless: Roger. Very weakly in the noise, but I think I can copy. Go ahead. 026:10:19 Aldrin: Okay. Roll 096, 356, 018; star 01 [garble]. 026:10:38 McCandless: Roger. I got all of that except trunnion. It's trunnion 242. Over. The crew switch their communications to operate through one of the Command Module's omnidirectional antenna, Omni A. 026:12:19 Collins: Houston, Apollo 11. How do you read on Omni A? 026:12:22 McCandless: Roger. Loud and clear, 11. 026:12:26 Collins: Okay. We'll stay on Omni A for a while, then. 026:12:30 McCandless: Okay. I got all your readback except the value for trunnion, and if it's 242, confirm, please. 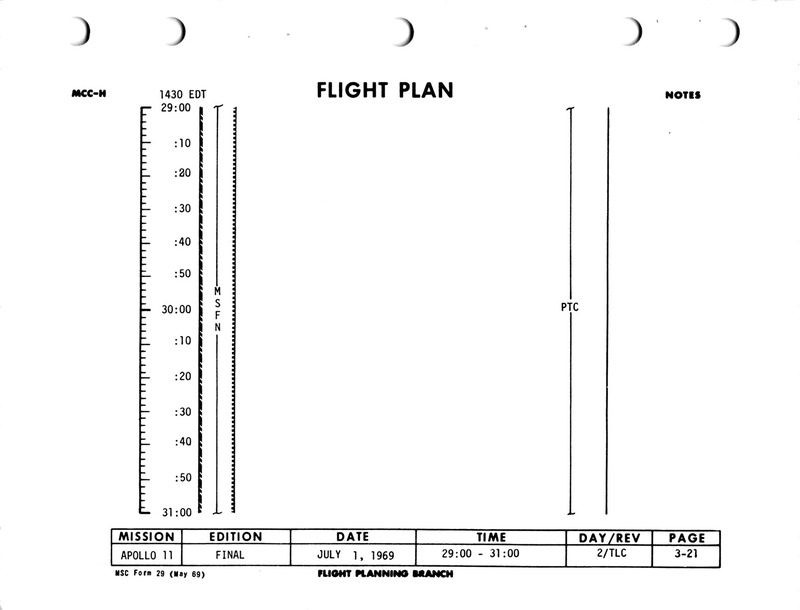 The Guidance Officer reports Apollo 11 is now in the attitude for the midcourse correction. This is Apollo Control at 26 hours, 27 minutes. Apollo 11's distance from Earth now 108,594 nautical miles [201,116 km]. Velocity, 5,057 feet per second [1,541 m/s]. We're about 17-and-a-half minutes away from the midcourse correction. 026:38:29 Collins: Houston, Apollo 11. Could you give us a couple of High Gain Antenna angles, please? 026:38:44 McCandless: Roger, 11. Pitch minus 35, yaw 0. Over. 026:39:28 Collins: Houston, Apollo 11. How do you read on High Gain? 026:39:30 McCandless: Read you loud and clear on the High Gain down here, and everything's looking good from our standpoint for your burn. Over. This is Apollo Control at 26 hours, 40 minutes. We're just under 4 minutes to the midcourse correction maneuver. Apollo 11's distance from the Earth is 109,245 nautical miles [202,322 km]. Its velocity is 5,033 feet per second [1,534 m/s]. Spacecraft weight; 96,361 pounds [43,709 kg]. One minute to the burn. The duration will be 3 seconds. 026:45:38 Armstrong: Houston, burn completed. You copying our residuals? 026:46:00 Armstrong: And, Houston, looked like we saw about 87 or 88 psi [600 or 607 kPa] on chamber pressure that time. I'd like you to look at that on the ground. The normal range for combustion pressure (i.e. the pressure in the combustion chamber as a result of burning) is 95 to 105 psi (655 to 724 kPa). 026:46:38 McCandless: 11, Houston. On our real-time telemetry we saw 95 to 97 psi [655 to 669 kPa] on chamber pressure. We'll - We will look at the recordings down here, though, and get back with you again. Over. 026:46:50 McCandless: And we've copied your residuals, 11. 026:46:58 Collins: No, we're not going to trim those residuals. This is Apollo Control. That was a good burn. The residuals are on the order of a half a foot a second or less, and will not be trimmed. We're showing spacecraft weight now as 96,159 pounds [43,617 kg]. 026:49:51 McCandless: 11, Houston. Could we get your Delta-V counter reading, please, from this burn? 026:50:00 Aldrin: That's minus 3.8. This is the Delta-V counter mounted on the EMS panel. It was set to the value of Delta-VC, 16.8, as given in the PAD. As the short burn progressed, this counter took the output from the EMS's accelerometer and used it to count down towards zero, whereupon it sent a shutdown command to the engine. The value was deliberately less than the actual desired Delta-VT (total) of 21.3 to account for the engine's tail-off thrust, the impulse supplied by the engine after the shutdown command. 026:51:23 Armstrong: [Faint.] Roger. Thank you. 026:54:41 McCandless: Apollo 11, this is Houston. Over. 026:54:45 Aldrin: Go ahead, Houston. Apollo 11. 026:54:47 McCandless: Roger. I just want to remind you, we haven't noticed on the TM the Verb 66 after the burn. And for your information, we played the recorded TV back last night, I believe, after you all turned in for your rest period, and the pictures came out quite well. Over. 026:55:10 Collins: Did you get any usable pictures out of MILA on that first pass? 026:55:15 McCandless: Not that we've seen. We had word on the voice loop that MILA reported that they had gotten a minute's worth of TV signal, and Goldstone reported that they had gotten about a minute's worth of modulation but that they weren't able to get anything off of it. 026:55:40 McCandless: Okay. Here's another input here, 11, that the MILA data was recognizable as a picture, but we don't have any evaluation as to the quality of the picture. Over. 026:55:55 McCandless: And for our information, we've been watching a pCO2 again. Did you change a lithium hydroxide canister this morning? Over. 026:56:08 Armstrong: Yes. We did, and we've been seeing 1.7 percent in the spacecraft ever since. 026:56:14 McCandless: Roger. That agrees with our data. 026:57:00 Armstrong: Houston, Apollo 11. We're starting our maneuver to PTC attitude. 026:59:21 McCandless: 11, this is Houston. Over. 026:59:27 McCandless: Roger. From a propellant-balancing standpoint, we recommend that you use quads Alpha and Bravo to start the PTC maneuvers. Over. 026:59:39 Aldrin: Roger. Understand Alpha and Bravo. This is Apollo Control at 27 hours. Apollo 11's distance now 110,198 nautical miles [204,087 km]. Velocity, 4,984 feet per second [1,519 m/s]. 027:06:14 McCandless: 11, this is Houston. Over. 027:06:19 Collins: Go ahead, Houston. 027:06:21 McCandless: Roger. For Cryo-balancing purposes, we'd like you to turn the heater in oxygen tank number 1, Off, at this time. Over. 027:06:32 Collins: Okay. Stand by. 027:06:35 McCandless: Everything else in the Cryo system remains the same. 027:06:56 Collins: Okay. We have O2 heater Tank 1, Off. 027:07:01 McCandless: Houston. Roger. Out. 027:07:10 Collins: How is EECOM today? Is he happy with all those good things? 027:07:14 McCandless: Oh, EECOM is happy, and after you get PTC set up, we've got a little procedure from EECOM here to check out the O2 flow and the O2 flow sensor in your cabin enrichment. Over. 027:07:35 Collins: It'll be a while, Bruce. We're just now arriving in PTC attitude, and we're going to our 20 minutes of monitoring thruster activity. 027:07:42 McCandless: Roger. We copy. He'll be here. Image measurement and triangulation suggests that two photographs are taken around this time. This is Apollo Control. The Passive Thermal Control being re-established by Apollo 11 is at the rate of three-tenths of a degree per second which would be three rotations per hour. 027:13:03 Collins: Houston, Apollo 11. Are you going to take control of the Omnis now and switch us between B and D? 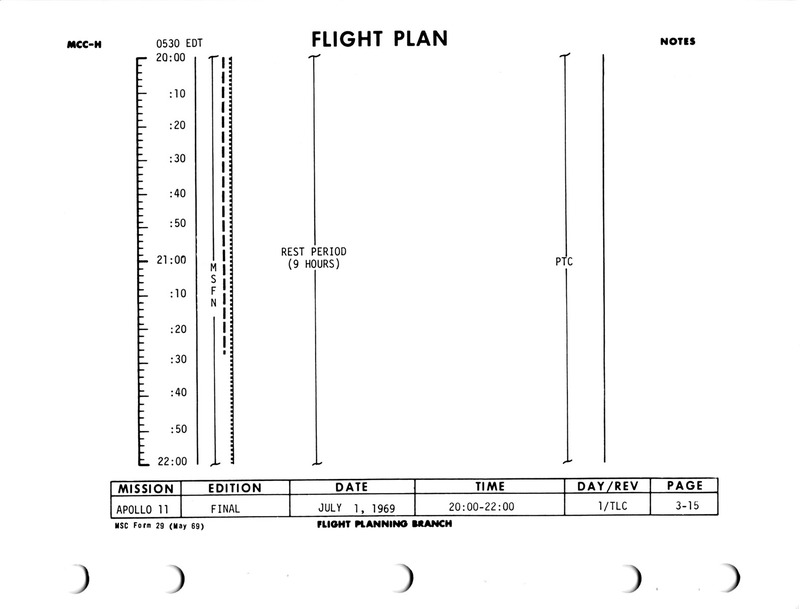 027:13:40 Lovell: Mike, how about selecting Bravo at this time, and I'll give you a Comm configuration here, shortly. 027:14:24 Collins: That PTC sure worked well last night. 027:15:24 Collins: You may have to repeat some of that there, James. We got a - We got a LM guy taking care of the High Gain right now. 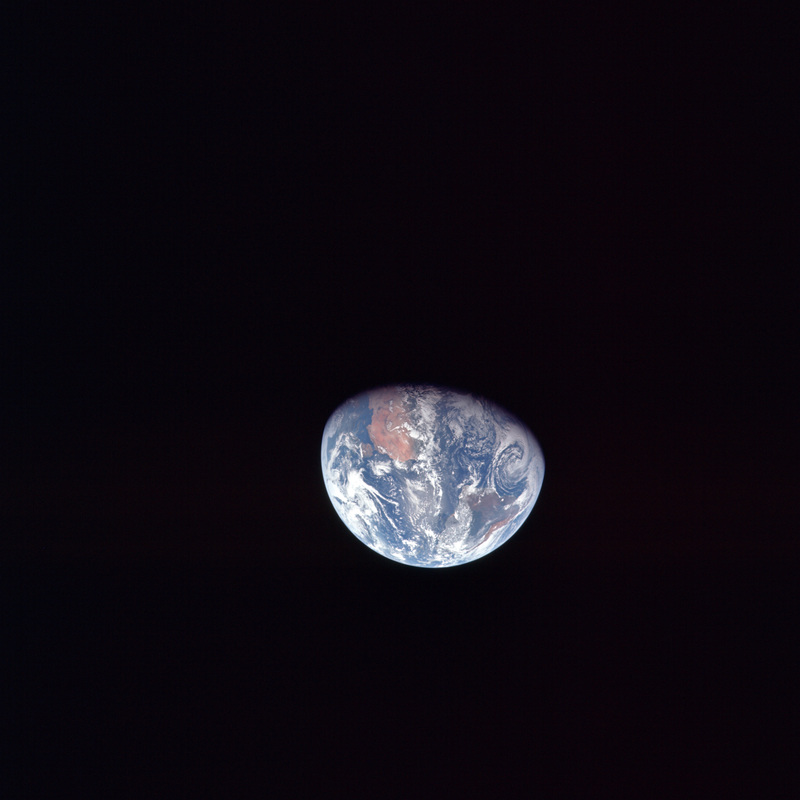 027:15:30 Aldrin: Yes, and he's eyeballing the Earth. 027:15:32 Collins: He's got his head out the window. 027:15:35 Lovell: I understand, I had trouble on [Gemini] 12 with him, too. 027:15:42 Aldrin: Say again what you'd like. 027:15:44 Lovell: Okay, The S-band antenna Omni A switch to Bravo which you have now, and S-band antenna Omni to the Omni position, and the High Gain Track to the Manual position. 027:16:02 Lovell: And the pitch and yaw angles are minus 50 for pitch and yaw is 270. 027:16:10 Aldrin: Minus 50 and 270. When the spacecraft is in a relatively stable attitude, communications are usually via the High Gain Antenna as long as Earth is within the range of its articulation. This dish antenna can automatically track a ground station by sensing when it is going slightly off track. If the spacecraft is rolling in its Passive Thermal Control mode, a set of four omnidirectional antennae mounted at 90° intervals around the periphery of the CM are brought into play. Normally only two of these antennae are used; B and D on opposite sides of the spacecraft, but these have to be switched every 10 minutes as the spacecraft rotates. It is possible for Mission Control to remotely switch the antenna but often they request that the crew carry make the switch. That's Jim Lovell, the commander of the backup Apollo 11 crew communicating with Apollo 11 at the present time. He also commanded the Gemini 12 flight in which Buzz Aldrin was his pilot. 027:17:09 Aldrin: Hey, Jim, I'm looking through the monocular now, and I guess to coin an expression, the view is just out of this world. I can see all the islands in the Mediterranean. Some larger and smaller islands of Majorca, Sardinia and Corsica. A little haze over the upper Italian peninsula, some cumulus clouds out over Greece. The Sun is setting on the eastern Mediterranean now. The British Isles are definitely greener color than the brownish green that we have in the islands, in the peninsula of Spain. Over. 027:18:03 Lovell: Rog. Understand that the Northern Africa - Mediterranean area is fairly clear today, huh? 027:18:14 Collins: Yes. We see a bunch of roads with cars driving up and down, too. 027:18:19 Lovell: Do you find that the monocular is any good to you, Buzz? 027:18:53 Aldrin: Got an anticyclone going in the southern hemisphere southeast of Brazil, and some - Well, the diameter of it must be over 2,000 miles [3,000 km] across. 027:19:15 Lovell: How does the weather look up in the southern part of the western hemisphere, or up in the United States area? 027:19:26 Aldrin: Well, you all are just beginning to come over the LM now. I can see parts of Central America, and it looks to be fairly, fairly clear there. The islands in the Caribbean there, beginning to come in and rather a few streaming lines of clouds. Looks like there is a system up to the - well, off of Greenland that has some large cloud streamers extending back down to the southwest. The east coast of the US is just coming into view now, and it doesn't look too bad that I can see right now. We may have some pretty good shots later on this afternoon. Over. 027:20:16 McCandless: Roger. Thank you. That was Buzz Aldrin giving the description of what he could see on the Earth. The backup Lunar Module Pilot Fred Haise is also in the Control Center at the present time. 027:21:50 Aldrin: Houston, Apollo 11. 027:21:54 Lovell: Go ahead, 11. 027:21:56 Aldrin: I've got a comment about the point on the Earth where the Sun's rays reflect back up toward us. In general, the color of the oceans is mostly uniform and it's bright and darker blue except for that region that's about one-eighth of an Earth's radius in diameter; and in this circular area, the blue of the water turns a grayish color, and I'm sure that's where the Sun's rays are being reflected back on up toward us. Over. 027:22:41 Lovell: Roger, Buzz. We noticed the same thing. It's very similar to looking at a light shining on something like a billiard ball or a bowling ball. You get this bright spot in the blue of the water, and that turns it to sort of a grayish color. The specular reflection of the Sun off the ocean surface is a phenomenon that artists depicting Earth prior to the Moon flights usually failed to portray. 027:22:57 Aldrin: Yes. Is there a Navy term for that? 027:23:00 Lovell: [Laughing.] A lot of gray paint. 027:25:27 Lovell: 11 - 11, Houston. 027:25:32 Collins: Go ahead, Houston. 027:25:38 Lovell: Mike, are you satisfied with P23 now? 027:25:43 Collins: Yeah, I'm happy with the last updates we got, you know, in terms of what it did to our state vector. Still not altogether happy with the various procedures. If we could pick stars within the smaller range of trunnion angles so that you could allow P23 to pick its own maneuver and go to that substellar point and then have that star visible, that would - seems to me to be the simplest and best way to do it. 027:26:19 Aldrin: [Garble] correction on that last [garble]. 027:26:20 Lovell: How about the horizon now? Is it pretty well defined for you and no longer hazy? 027:27:03 Lovell: Go ahead, Buzz. 027:27:06 Aldrin: Look like - Looks like the best way to get a good, steady view through the monocular is to just steady it out and let it float right in front of your eye, and then you kind of float up next to it so that you're not touching it at all. It has a very slow drift, and you get a better, steadier view that way. 027:27:47 Lovell: How does it feel to be airborne again, Buzz? 027:27:51 Aldrin: Well, I'll tell you, I've been having a ball floating around inside here, back and forth, up to one place and back to another. It's like being outside, except more comfortable. 027:28:04 Lovell: It's a lot bigger than our last vehicle. 027:28:10 Collins: Say again that last? 027:28:11 Aldrin: Yes. It sure is nice in here. 027:28:13 Lovell: I said it's a lot bigger than the last vehicle that Buzz and I were in. Jim Lovell is referring to his and Buzz's flight in Gemini 12. 027:28:17 Collins: Oh, yeah. It's been nice. I've been very busy so far. I'm looking forward to taking the afternoon off. I've been cooking, and sweeping, and almost sewing, and you know, the usual little housekeeping things. 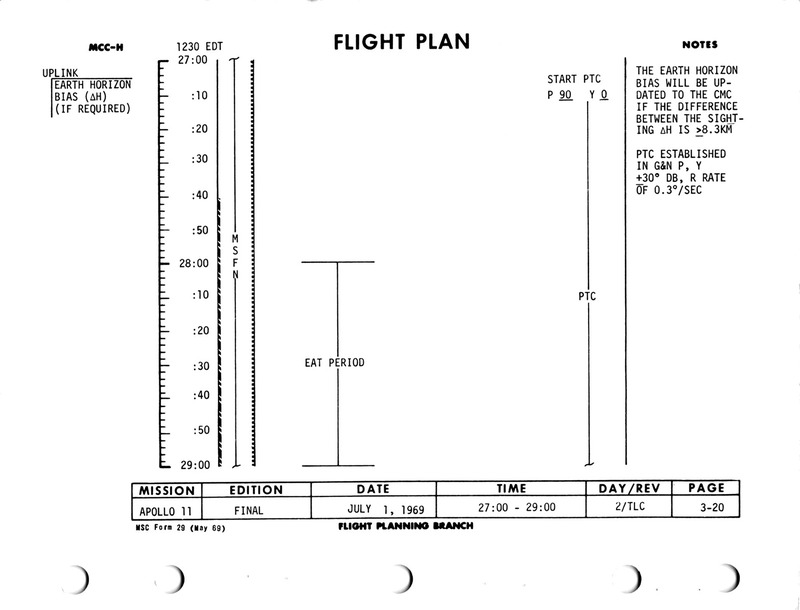 027:28:30 Lovell: It was very convenient the way they put the food preparation system right next to the nav station. 027:28:43 Armstrong: Everything's right next to everything in this vehicle. 027:28:48 Aldrin: Not where the waste management's concerned. 027:28:53 Armstrong: Jim, it's been a little warm in the machine throughout yesterday, and last night during the PTC, it cooled off somewhat with the windows buttoned up, and we've seen suit temperatures of about, oh, the high 40s and cabin temperatures in the low 60s. But this seems to be still a little bit on the - a little bit on the warm side. 027:29:28 Lovell: I understand that it got a little warm during the day and cooled down a little bit when you put the shades up, but you're still a little bit warm. Do you have any moisture condensation or anything like that on the wall? 027:29:40 Armstrong: No, we haven't been able to detect any moisture any place in the spacecraft. It seems to be fine. 027:29:50 Aldrin: One of the hydrogen filters - the one that we've got on the hot water - seems to keep flowing when you remove one of the food bags from it. Its flow rate is quite small, right near the end of one ounce, and that contributes a little bit of moisture to the atmosphere. 027:30:16 Collins: Yeah, I think on that hydrogen thing, it's - I'm not sure, but I think it's a back-pressure problem. If the thing sees any back-pressure at all, like when the bag is attached, well the flow rate will slowly decrease to where it's almost zero, and you wait, and you wait, and you wait for that last ounce. You think you have it and you remove the bag, and then you very rapidly thereafter see maybe, oh, a glob the size of a dime or a quarter come out and just hang there. That appears to be true even though the opening into the bag is not restricted. 027:30:54 Aldrin: In general, I think they do quite a good job, especially on the guns, in removing a lot of the hydrogen bubbles. 027:31:04 Lovell: Have the water temperatures been good? Are you getting hot water? 027:31:12 Aldrin: Yeah. It seems reasonably warm. 027:31:49 Collins: Jim, we've been sitting here a little over 20 minutes now. How does the thruster firing activity look? Are you ready to go on with this PTC? 027:31:56 Lovell: Rog. Stand by. 027:32:00 Lovell: We're all set to go, Mike. 027:32:04 Collins: Okay. I'll press on then. 027:35:59 Collins: Houston, Apollo 11. PTC has started and it looks good. 027:36:06 McCandless: 11, Roger. This is Houston. Roger. Out. This is Apollo Control at 27 hours, 46 minutes. Apollo 11's distance from the Earth is now 112,386 nautical miles [208,139 km]; velocity, 4,906 feet per second [1,495 m/s]. We now have the actual numbers on the Midcourse Correction maneuver. Ignition time was 26 hours, 44 minutes, 57.92 seconds. Duration of the burn was 2.91 seconds. Delta-V, 20.9 feet per second [6.4 m/s]. 027:47:22 McCandless: Apollo 11, this is Houston. Over. 027:47:27 Armstrong: Go ahead, Houston. 027:47:29 McCandless: Roger. If you're free for a couple of minutes, we have a procedure here that will let us verify the O2 flow transducer and at the same time get some more of our cabin enrichment out of the way. Over. Prior to their sleep period, Mission Control had notified the crew of some 'funnies' regarding the transducer that measures the flow of oxygen into the cabin. The flow of oxygen is not only necessary to keep the spacecraft pressurised against leaks and its consumption by the crew, it is also being use to gradually flush nitrogen from the cabin. At launch, the cabin was filled with a 60/40 mixture of oxygen and nitrogen. As they ascended through the atmosphere, the mixture began to be dumped overboard until the cabin had reached about 5 psi (35 kPa), a third of sea level pressure. As the mission continues the remaining nitrogen will gradually be replaced with pure oxygen. 027:48:37 Armstrong: [Faint.] Go ahead, Houston. We're ready to copy. 027:49:40 Armstrong: Okay. Understand that. [Pause.] Install the cabin quick disconnect out of R-6 on the 251 urine connector and verify the waste dump valve is closed, and say again the last part. 027:50:16 Armstrong: Roger. Put the waste management overboard drain valve to the Dump position. 027:50:20 McCandless: Right. That's the one down on panel 251 also. And we'll watch your O2 flow on telemetry down here. 027:52:49 Armstrong: Okay, Houston. That configuration is set up. 027:52:57 McCandless: 11, this is Houston. Say again, please. 027:53:02 Armstrong: You do have the O2 flow transducer checkout setup accomplished. 027:53:08 McCandless: Okay. Understand you have opened the drain valve at this time. 027:53:13 Armstrong: That's affirm. It's in Dump. 027:53:15 McCandless: Roger. We're not getting telemetry data from you right due to low signal strength. There it comes back. I expect it'll probably take us anywhere from 15 minutes to half an hour to see an increase in O2 flow due to the size of the cabin versus the small size of the drain. Over. 028:07:16 Collins: Houston, Apollo 11. 028:07:18 McCandless: Go ahead, 11. 028:07:21 Collins: Rog. I've got the world in my window for a change and looking at it through the monocular, it's really something. I wish I could describe it properly, but the weather is very good. South America is coming around into view. I can see on the - what appears to me to be upper horizon, a point that must be just about Seattle, Washington, and then from there I can see all the way down to the southern tip - Tierra del Fuego and the southern tip of the continent. 028:07:55 McCandless: Roger. Sounds like you've got a beautiful view up there. 028:08:01 Collins: Absolutely fantastic. I hope the pictures come out; we're rotating around where it's going out of view again. 028:08:09 Aldrin: I'm waiting to pick it up in the sextant. 028:08:14 McCandless: Sounds like one of these rotating restaurants. And Bruce McCandless is back on the CapCom console now. 028:30:33 McCandless: Apollo 11, this is Houston. Over. 028:36:09 Aldrin: Houston, Apollo 11. Do you need some help keeping Omnis locked on us? 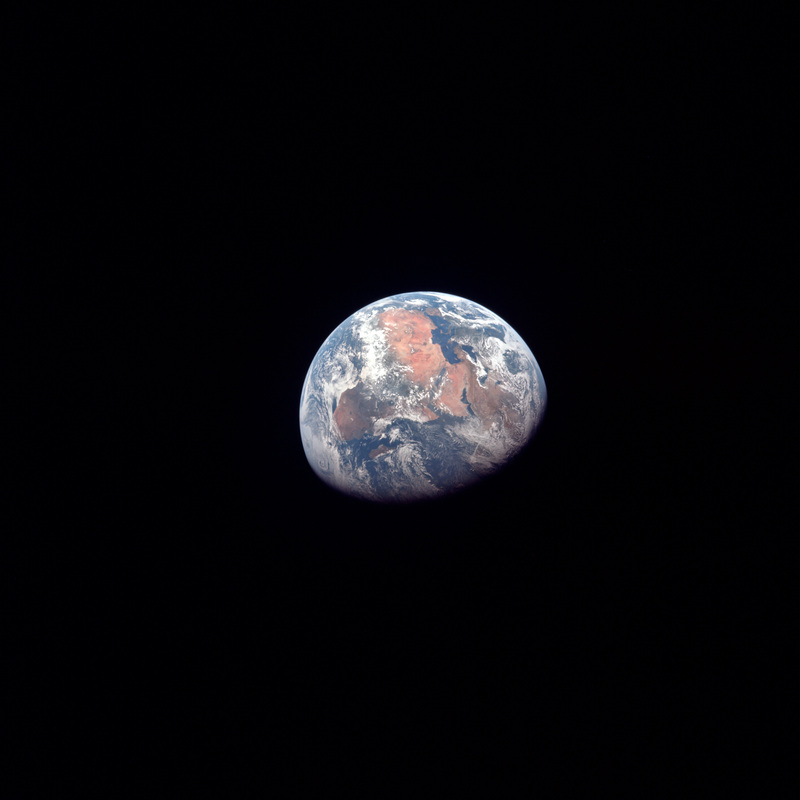 028:36:15 McCandless: Apollo 11, this is Houston. Negative. We had a command computer at the Madrid site go down. We had to switch over to Ascension temporarily. We're now back remoting through Madrid, and the computer is back, and we're ready to resume control of your Omnis and full communication. Over. The Command Module has four low-gain omnidirectional antennae spaced around its periphery, designated A to D, which can be used instead of the High Gain Antenna. As the spacecraft revolves, the crew can maintain communication by manually selecting whichever Omni is facing Earth. Additionally, Mission Control can remotely switch between antennas B and D on the crew's behalf. 028:36:38 Aldrin: Okay. You've got it. 028:37:05 Aldrin: Okay. The LM/CM Delta-P is 0.98. 028:37:10 McCandless: Roger. 0.98, and what have you been reading for O2 flow on your onboard gauge? Over. 028:37:23 Aldrin: Well, right now, after we put that gadget in, we've got it back to 0.35. Before that, we were reading off-scale low. I think ours is relatively correct, at least when time comes for the water accumulator to kick in at 10 seconds, it goes on up to about 0.75, 0.8, something like that. 028:39:06 Aldrin: Good to hear it. 028:39:21 Aldrin: We're right in the middle of - well either [garble] salmon salad, or something like that. That's probably why we're not answering you right away. As Buzz talks to Mission Control, music can be faintly heard in the background each time he keys his microphone. Your lowly editor had determined that the crew are listening to 'Angel of the Morning' by Merrillee Rush and the Turnabouts which was a hit in 1968. 028:39:33 Aldrin: My compliments to the chef, that salad salmon is outstanding. 028:39:41 McCandless: Roger. Understand that's the salad salmon. Over. 028:39:49 Aldrin: Something like that, salmon salad. 028:39:51 McCandless: There we go, the salmon salad, very good. 028:39:57 Aldrin: Okay. Bruce, we're coming up on the water accumulator activity, and it's going on up to 0.85, ah, oh, about 0.95 and it reached a peak there and then gradually dropped back on down to 0.6 now, 0.4, and it looks like it's pretty well - pretty well leveling off back down to 0.35. Over. At 28 hours, 40 minutes; we're showing Apollo 11's distance as 114,922 nautical miles [212,836 km] from Earth; velocity, 4,819 feet per second [1,469 m/s]. The crew is eating lunch at the present time, and it sounds like there's some music in the background that they are enjoying during their lunch period. 028:41:32 McCandless: Roger. On that O2 flow transducer, down here on telemetry, our values are agreeing pretty well with what you read out onboard, and the EECOMs have been noticing this cycle, but it still looks like the indicated rate is lower than what we would expect. We're still working on the problem, and we'll let you have a more complete diagnosis on it in a little while. 028:42:03 Aldrin: Okay. It's a tight fix then. 028:42:04 Collins: We run a tight ship. 028:42:08 McCandless: Roger. Is that music I hear in the background? 028:42:15 Collins: Buzz is singing. 028:42:31 Collins: Pass me the sausage, man. Image measurement and triangulation suggests that four photographs are taken around this time. This is Apollo Control at 29 hours into the mission. Apollo 11's distance from Earth is now 115,837 nautical miles [214,530 km], velocity 4,788 feet per second [1,459 m/s]. Spacecraft weight 96,117 pounds [43,598 kg]. This is Apollo Control at 29 hours, 20 minutes. Apollo 11's distance from the Earth is now 116,747 nautical miles [216,215 km], velocity 4,758 feet per second [1,450 m/s]. One of the clocks in the control center is now displaying the time to landing, the landing time being based on the time in the Flight Plan. It shows we're 73 hours, 26 minutes, 30 seconds from the lunar landing. There are no communciations with Apollo 11 for 50 minutes, while the crew have lunch. In the next chapter, they resume viewing the Earth as the spacecraft rotates in Passive Thermal Control mode.